Jungle boots! These Danner Men's 11500 Black Super Rain Forest Waterproof USA-Made Work boots are big, hard-core black leather boots. We can almost see the camouflage. Seriously, this is plain, straightforward men's footwear - no gimmicks, no cutesy features. The D ... (see full details) (see specifications) #DNN11500. These waterproof boots are manufactured here in the USA and feature full-grain double thick leather uppers that are triple stitched with very strong nylon thread. 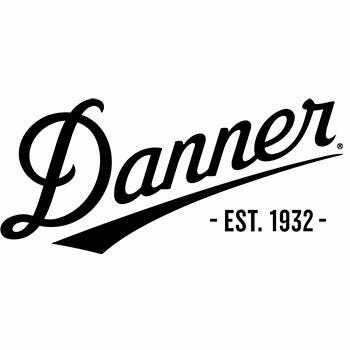 Because of this stitch down construction, you can get the water-resistant boots redrafted at Danner's Portland factory, if needed. The rugged leather resists alkali, lime, and anything else you'd rather not get on your feet. There's even double-thick leather on that covers the toe boxes and the tops of your feet for added protection. These black shoes have a soft lining to keep you comfortable all day, complimented by a waterproof Gore-Tex interior liners that are guaranteed for one year. This makes these Danner boots 100% waterproof. The removable padded insoles and premium steel shanks will provide you with much-needed arch support working in the jungle - or even close to the jungle. For even more coverage, this footwear meets or exceeds the ASTM F2892-11 electrical hazard rating. These premium boots are constructed with non-conducive electrical shock-resistant heels and soles, so you'll be kept safe around open circuits. The stitchdown Vibram thick rubber soles are oil-resistant as well as extremely durable. You'll get a wider platform to stand on, giving you stability underfoot. This Vibram 132 Montagna outsoles feature lugs that are angled to provide you with substantial support, whether you're climbing or descending a hill. These center lugs combine with the unique Vibram rubber compound, so you'll get excellent traction on wet and dry surfaces. Four heavy duty steel eyelet grommets for lacing on the bottoms, and four steel hooks at the top-with one extra steel eyelet at the very top for tight lacing on these slip-resistant boots. Some people think simply - and that's good. You work. You need Danner footwear that's going stand up to your work environment. These Danner Men's 11500 Black Waterproof Super Rain Forest USA-Made boots are for you. Go ahead and order your pair today from the Working Person's Store. These Danner boots are the most comfortable I ever bought; while in the Air Force, I did wear the Fort Lewis but the Super Rain Forest style is the best. Danner Customer Service is also great. I like good old American-made products like these boots. I have been wearing Danner Super Rainforest boots now for over three years. Still on the original laces. These are the toughest boots money can buy. Pro's: very longlasting leather, minimal maintence, solid height, triple stitched, made in the usa, re-sole-able. Cons: Long break-in time (30 days), stiff factory soles, weight (they get heavy after 12 hours), price. Bottom line: the best money can buy. I'm on my third set of soles after three years and the leather is still serviceable with no leather repair. I have had other boots that don't even last a year. Much better choice than redwing, timberland, or carolina's (carolina's being the worst). Enjoy! There is no way I would work in anything but these boots. #1A+ boot and company. My husband really likes these boots. He is a forest ranger, and walks in all kinds of terrain, and needs the protection of the high tops. It was a good experience when I ordered these boots from this company. I was assured I could send them back if t hey did not fit. My husband was very satisfied. Thank you. Danner Boots: Men's Black 11500 USA-Made EH Waterproof Super Rain Forest Boots is being added to your cart.